IN his continuing search for the more weird, wacky and wondrous in the world of travel, David Ellis says that not content with an-already 1.2 million items for sale in its 330 departments, London's Harrod's department store now has something totally new for its most-discerning inner-CBD customers – multi-million pound super-yachts. The store's built a special showroom with models of the yachts, plasma screen video footage to show what one- or three-million pounds will get you, and put in a team of yachting salesmen from top English brokers, Watkins Superyachts to help shoppers with their decisions. Duck-in for a chat and you could walk away having put a deposit down on a GBP7M (AU$10.5M) ketch you could be sailing next weekend with family and a friends. 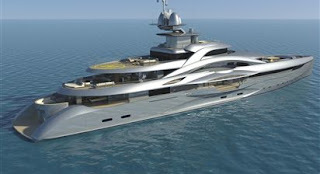 Or if you've the money, and the patience, order a 90-metre, 6-deck Mars super-luxury motor-cruiser that will cost you around GBP100m (AU$153m) – and take three years to build from scratch. Then go and reward yourself with lunch and a drink in any of Harrod's eight restaurants and cafés, and ponder how much its going to cost you to pay the recommended 29-crew from captain through to chefs, waiters, room stewards and deckhands to look after yourself and a up to fourteen sleep-aboard mates on that motor-cruiser… that you won't be sailing until around summer 2014.